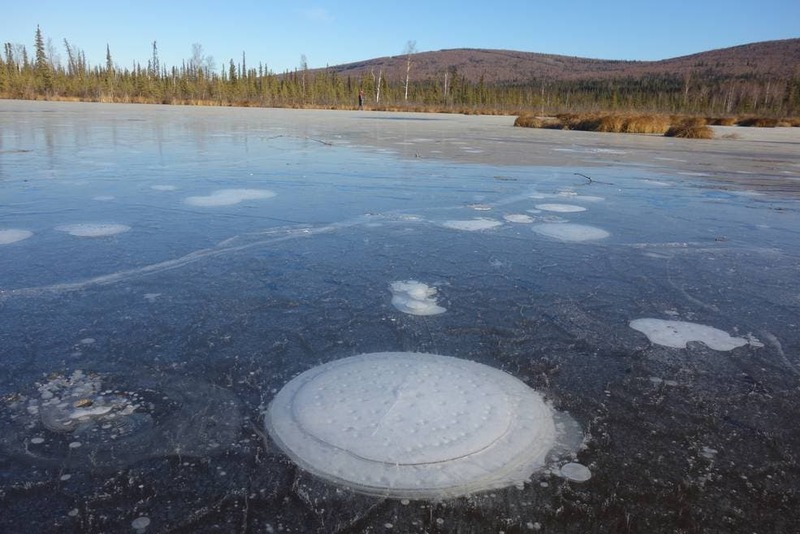 A NASA study of certain bubbling lakes in the Arctic suggests that methane deposits are being released due to an understudied phenomenon called ‘abrupt thawing’. Methane — which is 30 times more potent at trapping heat than carbon dioxide — has been frozen for potentially thousands of years and its sudden release could significantly impact the climate by the end of the century. Methane bubbles up from the thawed permafrost at the bottom of the thermokarst lake through the ice at its surface. Credits: Katey Walter Anthony/ University of Alaska Fairbanks. Methane and carbon dioxide are both produced in thawing permafrost as animal and plant remains decompose. As long as this organic matter remains frozen, it will stay in the permafrost. However, if it thaws, it starts decaying, releasing carbon dioxide or methane into the atmosphere — which is why scientists are deeply concerned with the present development. Right now, Earth’s atmosphere contains roughly 850 gigatons of carbon (a gigaton is about the weight of 100,000 school buses). Scientists estimate that there is about twice as much carbon frozen in permafrost than present in the atmosphere today. That doesn’t mean that all of the carbon will end up in the atmosphere. The trick is to find out how much of the frozen carbon is going to decay, how fast, and where. The full picture seems to be even more complex than previously thought. In a new study, scientists have discovered a new source of methane that hasn’t been accounted for by climate models — methane emissions from ‘thermokarst‘ lakes. Such lakes form when permafrost taws at a faster rate and deeper levels than usually happens. This sudden thawing creates a depression which fills up with rainwater, ice, and snow melt. The water’s presence then leads to even more thawing at the shores of the lake, speeding up the rate of methane release into the atmosphere. Walter Anthony and colleagues used a combination of computer models and field measurements to reach the conclusion that abrupt thawing more than doubles previous estimates of permafrost-derived greenhouse warming. Current models estimate carbon emission from thawing permafrost as a gradual process. These new results suggest that in reality, the Arctic’s thawing feedback loops are more complex than we suspected. It’s all especially concerning considering that the IPCC — the leading international body for the assessment of climate change — did not incorporate any permafrost carbon emissions and the resulting amplification of climate change in its most recent climate projections. This means that it will be even more challenging to keep global temperatures below the 1.5- or 2- degrees Celsius target set by the international community under the Paris Agreement. Even so, methane emissions from thawing permafrost pale in comparison to the amount of human fossil fuel emissions. According to the researchers, permafrost methane emissions account for only 1% of the global methane budget. So the best thing we can do is to transition as fast as possible to a carbon-neutral society. “But by the middle to end of the century the permafrost-carbon feedback should be about equivalent to the second strongest anthropogenic source of greenhouse gases, which is land use change,” Walter Anthony said.